Digital Xbox One version reviewed. Giant Squid Studios is helmed by Matt Nava, the art director from Jenova Chen's 'Flower' and 'Journey' titles. 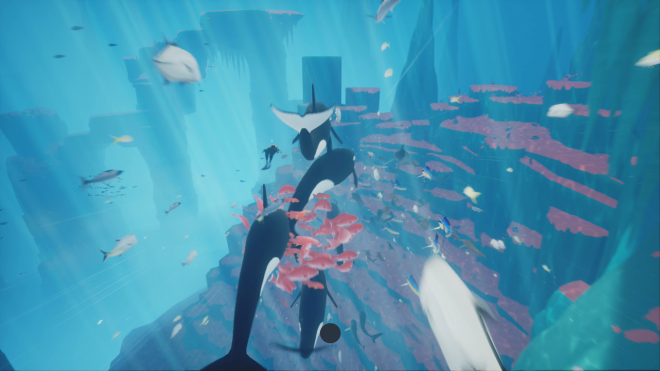 Nava wanted to incorporate his love for scuba diving into a video game and created 'ABZÛ', a distinctly 'Journey'-like game set in a vibrant, crowded ocean. 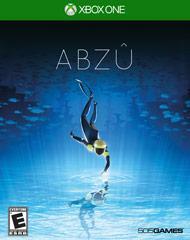 'ABZÛ' is, on a gameplay level, a swimming simulator. It requires a very low level of interaction, nothing more advanced than looping and flipping around in a 3D aquatic environment. Some of the aquatic creatures present in the ocean are amenable to being "ridden" by the diver, where I would swim alongside them, grab hold of them along a fin, and be able to move around the waters at their speed. This can be a lazy experience, like grabbing onto a sea turtle, or a social one. Dolphins love serving as a mount and all of their little friends come along too, so we can jump out of the water and play around as a pod. 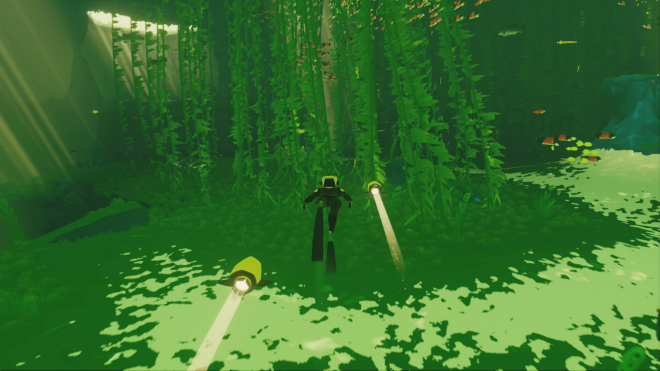 Friendly robot guys can be activated and will follow the diver along on their journey, and have a more practical application by opening up new areas. Other interactions are minimal, but not without implication. The collectible seashells can be safely passed over, but the ocean floor has tufts of anemone and seaweed that, when activated, release a single species of fish or cetacean into the surroundings. Each new level is completely dead, bereft of anything but the most pitiful plant life, and the diver has to swim into an abandoned temple to revive the local fauna. Once that is complete, I was free to explore the level at my whim, releasing animals where I could, swimming alongside them, and ogling the pretty colors. In this way 'ABZÛ' is not unlike a fireworks show, where the appeal is the explosion of colors and sometimes surprising or dramatic displays of movement. 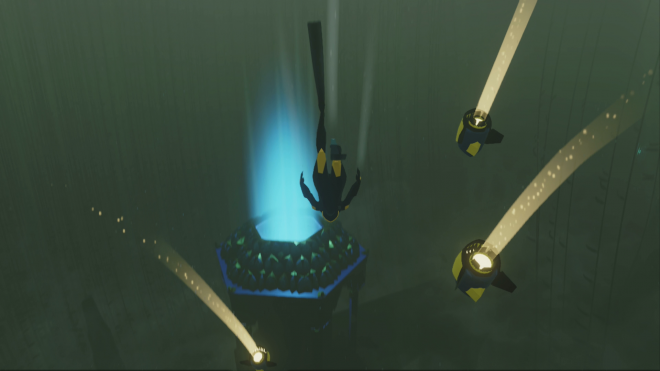 Also like a fireworks show, 'ABZÛ' often has a tough time carrying on any kind of deeper meaning. It's pretty yes, but also kind of superficial. The temples, the occasional hieroglyphs on the side of underwater rock formations, the diver's ability to remain underwater indefinitely without regard for oxygen or pressure, it all could have been explained a little bit or even just alluded to. As it stands, there is little to experience here beyond looking. To be fair, the looking is really nice. The activity and flourishes of the fish are amazing, and grabbing onto a swordfish which then slams through a frantic, swirling vortex of shiny silver fish is beautiful. Sharks continue to feed even when the diver is hanging onto them, orcas will happily breach at every opportunity, and groupers will playfully swim away from me when I'm trying to catch hold. Every level has a meditation point where the diver can sit and just watch, or even take the perspective of one of the many underwater species. I suppose I can take the opportunity to make my own narrative, which in this case skews toward the post-apocalyptic. Perhaps there was once a thriving underwater human civilization and the diver is one of the few remaining survivors, taking the opportunity to simply enjoy the beauty of the ocean one final time before their own inevitable demise. Or maybe, in a less depressing scenario, the diver is the scout for an expanding seafaring culture, looking for suitable marine neighborhoods for a new colony. 'ABZÛ', like any good art, is conducive for this kind of speculation. As a video game, it needs a little more meat on its bones. Not a lot of meat - some of my favorite experiences have been firmly in the realm of walking simulator - but something. 'ABZÛ' is gorgeous. It's the highlight reel of an underwater documentary, all of the boring and gloomy shots cut out, and mixed with just a little bit of fantastical. In between the relaxed levels are more fast-moving on-rails bits, where the diver enters a jetstream and dashes between schools of fanciful creatures. All of the fish are real life species (to the extent of my limited knowledge) and have an ecosystem of their own. 'Journey' composer Austin Wintory does the score, and it is just as good as the visuals. It has that airy, epic movie kind of sound without coming off as cheap or melodramatic. The sound effects are excellent, from the raucous splashes of the orcas to the excited chirps of the dolphins. 'ABZÛ' is an exceedingly short game and can be finished, in the conventional sense, in just a few hours. The bigger draw is quiet contemplation of the sea life, which is pretty but ultimately limited, bordering on shallow. Meditation points and seashells serve as collectibles, should that appeal to you. In this violent, bloody holiday release schedule it is nice to have games like 'ABZÛ'. It is an artistic, aesthetic game, suited for watching and observing, not playing in a strict sense of the word. Its undersea beauty is unmatched, but leaves me wanting more.